We have a lot of mud in Wales, and this winter it has excelled itself, making hiking something of a messy process, so it would be a pleasant change to see some good clean snow for a change. Then back to mud, of course. I love those misty mornings with the sun beginning to filter through. It’s worth finding a local river scene on these mornings as they lend themselves well to this sort of atmosphere. This scene shows only part of the composition, and I have applied masking fluid at the top of the birch trees to accentuate the hard edges of the ice-rimed branches. When this had dried I worked in the background wet-in-wet to create a soft, misty effect, and this included the distant trunks and branches. It was an intensely cold morning. I have washed in Naples Yellow into the right-hand sky area and into the birch trees to add a sense of warmth, as well as in the reeds. The water was again achieved wet-in-wet – note how the bank below the birches has a slightly darker reflection than the bank itself. 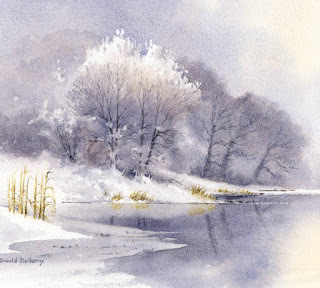 This is taken from my Winter Landscapes book which is crammed with ideas for painting winter scenery, even if you have no intention of going outside to take full advantage of all that glorious mud!!! 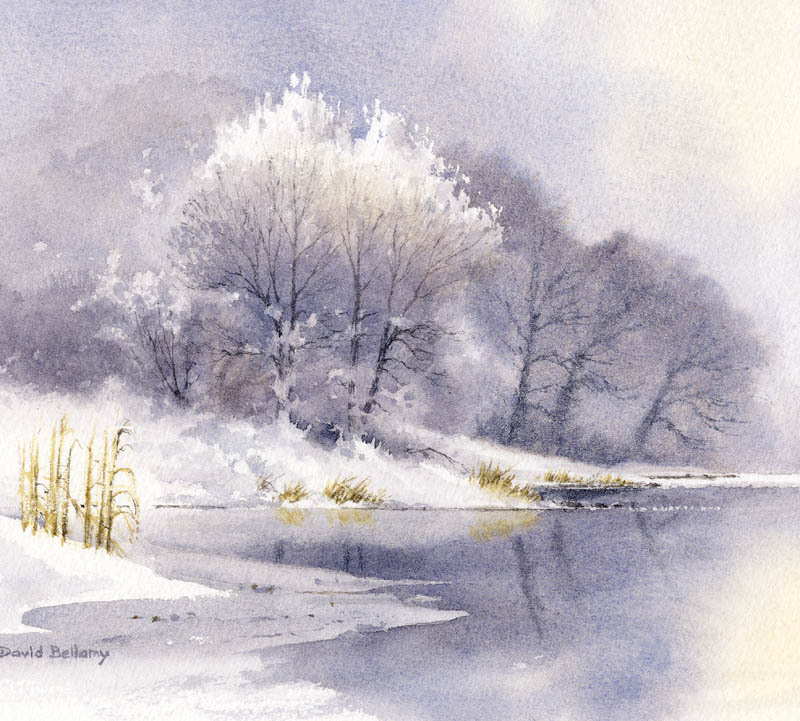 This entry was posted in adding warmth to a winter painting, atmosphere, David Bellamy, Painting misty scenes, painting reflections, Painting snow, wet in wet technique, Winter landscapes in watercolour, Winter trees in watercolor and tagged #saunderswaterford, #stcuthbertsmill, Watercolour techniques by David Bellamy. Bookmark the permalink. I really enjoyed the deep snow in early December, some beautiful scenes, even with the lack of luminosity. Ideal for magical walks and to collect photos to use later. Unfortuately, it was too short-lived! Thank God for such brief cheering interludes, as it has been a rather grim and wet winter overall so far. Really beautiful and inspirational. Thank you .